COLUMBIA, Mo 7/30/14 (Beat Byte) -- A documentary film maker is seeking information from Columbia residents and organizations about Korla Pandit, an internationally famous black musician who inspired Liberace and launched the flamboyant pianist's career. Born John Roland Redd in 1921, Pandit grew up in Columbia and graduated from Douglass High School. His father, Rev. Ernest Redd (middle picture at this link) moved the family to Columbia from Hannibal to become pastor at Second Missionary Baptist Church on East Broadway. Redd left his then-segregated hometown for California to start a 50-year entertainment career at a time black performers were rarely seen in Hollywood. He changed his name to "pass as an Indian immigrant from New Delhi, India," film maker Eric Christensen told the Columbia Heart Beat. "He went on to star in his own TV show and rose to fame in the 1950's as Korla Pandit." Christensen and fellow documentarian John Turner are wrapping "Korla," their film about Redd's pseudonymous life (clip here). Pandit/Redd's pseudonym played off his exotic good looks, which he highlighted on stage with turbans, jeweled costumes, and flamboyant mannerisms -- all the qualities Liberace would later adopt after he was hired to replace Pandit on a television show in 1953. In fact, the only significant performance difference between Pandit and Liberace was that Pandit played the organ silently, Liberace the piano boisterously. Pandit never spoke on air, playing his Hammond organ and staring into the camera like a mesmerist charming his television audience. 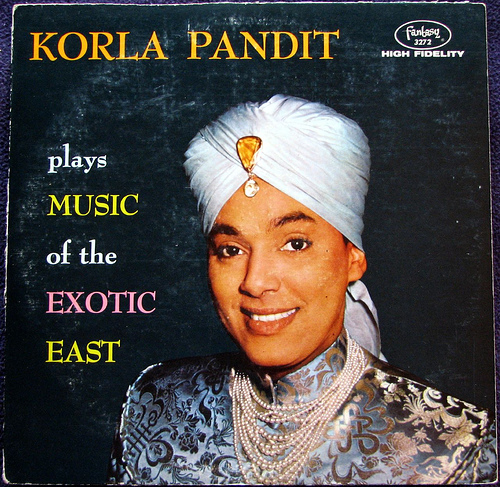 "Korla Pandit was one of the TV originals," television critic Roy Trumbull wrote in a short retrospective o n Pandit's life. "With his jeweled turban and his haunting good looks, he made many hearts throb." But making white women's hearts throb as a black man so many decades ago was taboo. "No one seemed to notice that the housewives of L.A. were swooning over a light-skinned African-American," wrote Phil Nobile about Pandit in a review of Steven Soderberg's Liberace biopic, Behind the Candelabra. Keeping his identity secret was a main theme of Redd/Pandit's life. Entertainment blogger Joe Blevins recalled meeting Pandit when the then-72-year-old icon did a cameo in Tim Burton's 1994 movie, Ed Wood. Blevins had seen old film clips and album covers featuring Pandit many times before. "Something about the image stopped me in my tracks every time I saw it," he wrote. "Who was this odd, androgynous man sitting stiffly behind a keyboard and wearing the kind of suit a businessman would be buried in? Why did he seem to be wearing eye shadow and lipstick?" Redd/Pandit came to Los Angeles in 1947 under a variety of assumed names. He was Juan Rolando from Arizona, or John Red without the second "d". It wasn't until two years after his 1998 death that his true heritage -- as an African-American from mid-Missouri -- came out in an article for Los Angeles Magazine. "He was a handsome holy man. An organ virtuoso. A star from the East," wrote journalist R.J. Smith. "Korla Pandit mesmerized generations -- while keeping a secret until his dying day." Some entertainment historians believe Pandit's career was the very embodiment of this secret, born of his desire to flee racial prejudice. To biographers -- and documentarians -- John Redd's flight into the world of Korla Pandit is both fascinating subject matter -- and complicating factor. "We already have contacted the Daniel Boone public library, the University of Missouri, and his school (Frederick Douglas High) and have gotten only a little information and some photos," Christensen explained. If readers have any information about John Redd, aka Korla Pandit, please email editorial at columbiaheartbeat.com We'll pass your information along to Mr. Christensen and his film-making crew. (Click pix above for larger images).